Championship leaders Bristol survived a real scare to overcome Jersey 40-29 at Ashton Gate. The islanders had led 19-15 at half-time, helped by two tries from winger Fautua Otto against his former club. But second-half scores from Charlie Amesbury, Samoan Jack Lam and former British & Irish Lion Gavin Henson gave the hosts the victory. A late penalty-try ensured Jersey's efforts were rewarded with a bonus-point. 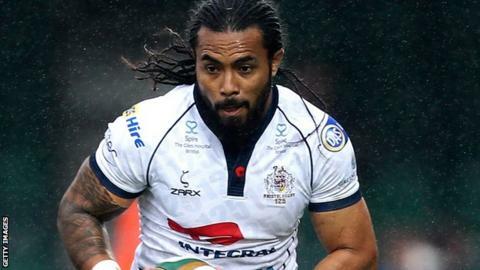 Bristol's bonus-point win takes them to 99 points in the Championship table, and they will have the chance to bring up the century in their final league game against promotion rivals Worcester Warriors next weekend. Both sides had registered tries within five minutes, with Amesbury crossing the whitewash for his first of the night before Otto scored in the corner against his old side. Matthew Morgan's try, exploiting a gaping hole in the Jersey defence, pulled Bristol 15-5 ahead but again Jersey hit back with tries from Paula Kaho from a maul and Otto again after good work from centre Drew Locke. Amesbury's second came ten minutes into the second period when he latched onto Morgan's cross-field kick, but the visitors would not lie down and Aaron Penberthy's drop-goal squared the game at 22-22. It remained that way heading into the final quarter, but Lam's try from a maul and then Henson's score looked to have denied Jersey a point. With time ticking away though the referee awarded them a penalty-try as the pack headed towards the line, and that was enough for the bonus-point. The win takes Bristol to 99 points for the season, eight clear of title-rivals Worcester who have played a game fewer. Both of those sides are already assured of play-off spots, while Jersey are heading for their first mid-table finish in more than a decade after numerous title pushes and relegation battles. Bristol: Wallace; Tovey, Maule, Henson, Amesbury; Morgan, Hampson; Genge, McMillan (capt), Perenise, Glynn, Townson, Koster, Robinson, Eadie. Replacements: Stephenson, Cortes, Jones, Lam, Kessell, Robinson, Watkins. Jersey: Penberthy; Dawson, Locke, Robling, Otto; Bentley, Glynn; Lancuba, Garcia-Veiga, Herriott, Campbell, Phillips, Rae (capt), Buckle, Kaho.